At Nobel Peace Awards, China's Iron Fist Will Echo Friday's ceremony in Norway will be most notable for who isn't there: This year's laureate, Liu Xiaobo, languishes in jail amid China's crackdown on dissent. It will be the first time a peace prize winner or representative hasn't been allowed to attend since Nazi Germany barred the recipient in 1935. 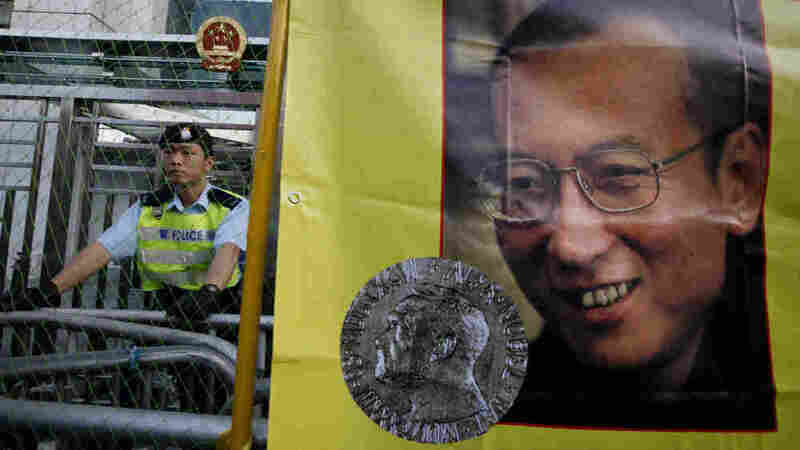 When the Nobel Peace Prize is handed out Friday in Norway, there may be two empty chairs set out on the awards platform for this year's laureate, Liu Xiaobo, and his wife. Liu languishes in jail and his wife, Liu Xia, is under house arrest amid China's sweeping crackdown on dissent ahead of the ceremony. Even his supporters are being discouraged from attending. In 1975, the Soviet government allowed Andrei Sakharov's wife to collect his Nobel Peace Prize. China has made no such concessions for Liu. Friday's awards presentation will be the first time that a Nobel Peace Prize laureate or representative has not been allowed to attend the gala since Nazi Germany barred pacifist Carl von Ossietzky from going in 1935. It's not a historical comparison that China, which has tried hard to rebrand itself, likes very much. But Jeffrey Wasserstrom of the University of California at Irvine said Beijing has only itself to blame. The Chinese government's response "undermined their own efforts to be seen in a new way by falling back into very much of a kind of Cold War way of responding," Wasserstrom said. As part of the latest crackdown, China has detained as many as 200 activists and dissidents or prevented them from leaving the country. A prominent Christian human rights lawyer, Fan Yafeng, said he was detained in October, beaten by police and is now a prisoner in his own apartment, guarded by eight police officers. "The crackdown is comprehensive," Fan said through a translator. "It's preventing me from taking part in any of my activities as a lawyer, as a Christian or as a scholar. I can't leave my house for seminars or to go to church or to do anything. They are trying to cut all my connections with the outside world." Even though Fan says his cell phone is being interfered with, he has managed to post on Twitter. The 1970's Soviet Union this isn't. There is a social and economic revolution going on -- just not a political one. Perhaps the most surprising thing is that a huge proportion of China's people, for better or worse, doesn't seem to care. "We're not quite interested in this topic because we don't see so much relevance with our regular life," said graduate student Qian Jin. "It's just so abstract. It's something that's so far away from my everyday life." Despite popular indifference, Beijing has launched a counteroffensive against the Nobel Committee and what it portrays as Western conspiracies against China. 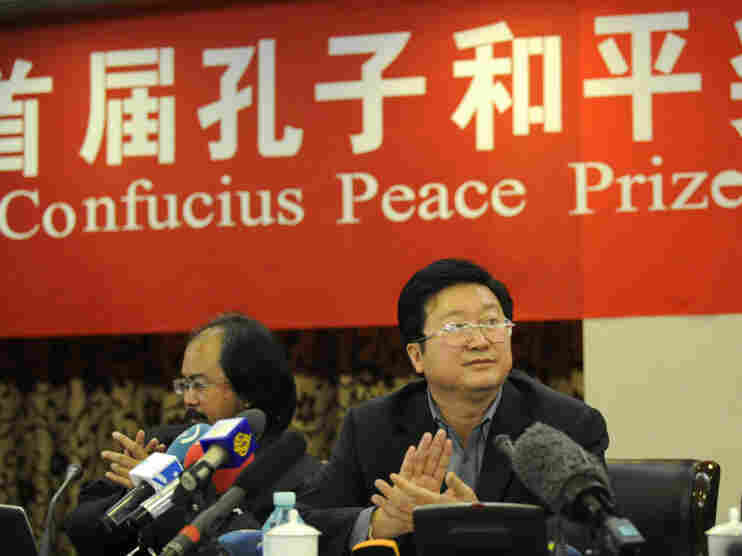 A pro-government group in Shanghai has even set up an award called the Confucius Prize to counter the Nobel, and China has also succeeded in persuading some countries to boycott Friday's Nobel ceremony. One man they have not been able to silence, however, is AIDS activist Wan Yanhai, who happened to be in the U.S. when the prize was announced in October. He said that regardless of government propaganda, the fact that the prize was awarded to Liu put it into the public realm and that in itself creates discussion among Chinese people. "People are sharing information and discussing the issue, so democratic awareness will be growing," Wan said. He's under no illusions about the hard-line political situation in China, but he isn't completely pessimistic. "I believe that China's Communist Party will continue to keep a hard line for some time, but I don't believe they can keep a hard line for ever," Wan said. His colleagues at his organization in Beijing have already received a visit from the police, who warned that their work will become more difficult if he attends the ceremony in Oslo. But Wan, who was to arrive in Oslo from Washington on Thursday, said he is going anyway.